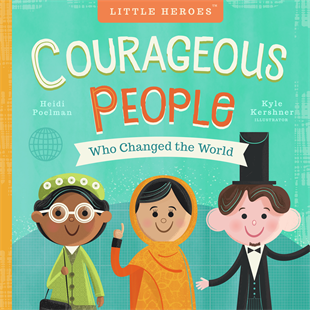 I love the inspiration the Little Heroes books provide young children! 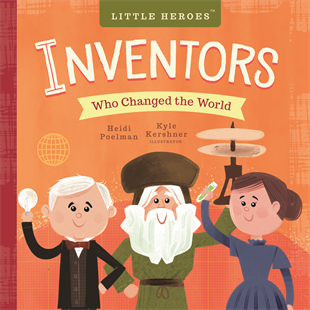 This colorful board book shares the experiences of inventors whose discoveries made a huge impact on society. I learned some new things with the lesser known inventors, and was happy to see ones that I recognized as well. Each spread is devoted to one figure, and I love that it has a blurb about what life was like for that inventor as a child, what he or she did to make a change, and a brief inspirational quote from that person. The illustrations are dynamic and adorable, I love this artist's style! A wonderful book that encourages curiosity, finding solutions, and shares the joy of discovery. Perfect for a wide range of ages. Don't miss the first Little Heroes book . 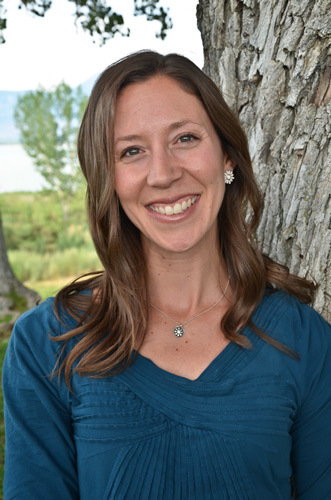 . .
Heidi Poelman received her degrees in communication from Brigham Young University (BA) and Wake Forest University (MA). Heidi is the author of the Little Heroes series, A is for Abinadi, A is for Adam, I Can Love Like Jesus, The Two-Minute Secret to Staying in Love, and a Mother’s Greatest Gift. She particularly enjoys writing about inspiring people and ways to strengthen families. She seeks inspiration by seeing new places, playing outdoors, and getting lost in a good book. Heidi and her husband Scott live in Utah with their four bright-eyed children. Learn more at www.heidipoelman.com . Familius is a global trade publishing company that publishes books and other content to help families be happy. We believe that the family is the fundamental unit of society and that happy families are the foundation of a happy life. We recognize that every family looks different, and we passionately believe in helping all families find greater joy. To that end we publish books for children and adults that invite families to live the Familius Nine Habits of Happy Family Life: love together, play together, learn together, work together, talk together, heal together, read together, eat together, and laugh together. Founded in 2012, Familius is located in Sanger, California. This high-quality board book is adorable! I'm a sucker for illustrations, and this one is right up my alley. It spotlights four men and four women who have become historical icons. Because the focus of the book is on fighting for freedom, slavery and civil rights have the majority of emphasis with five out of the eight. Women's suffrage, peaceful protest, and female education are the other topics. William Wilberforce was the only lesser-known figure, and the others are all highly recognizable. I loved that each layout has a blurb about what the young person saw that needed to be changed, and then another short paragraph that tells what the person accomplished in order to make that change. I also appreciated that there is an inspirational quote from each person, and I felt that it brought the heroes to life with their real words. The content is very age-appropriate and while kept to simple terms, can be a starting point for important conversations between parent and child. The dynamic illustrations use pleasing color palettes, eye-catching compositions, and friendly faces for an overall positive vibe.